Yen Tu (Yên Tử) Mountain is one of the highest mountains in the Dong Trieu (Đông Triều) Mountains. It is located in the north-east Vietnam, within the area of Quang Ninh (Quảng Ninh) Province. Apart from being a natural landscape, Yen Tu Mountain has many historical relics and is considered as “The Buddhist capital of Vietnam”. From Hanoi, tourists can get Yen Tu by private car, shuttle bus or motorbike. 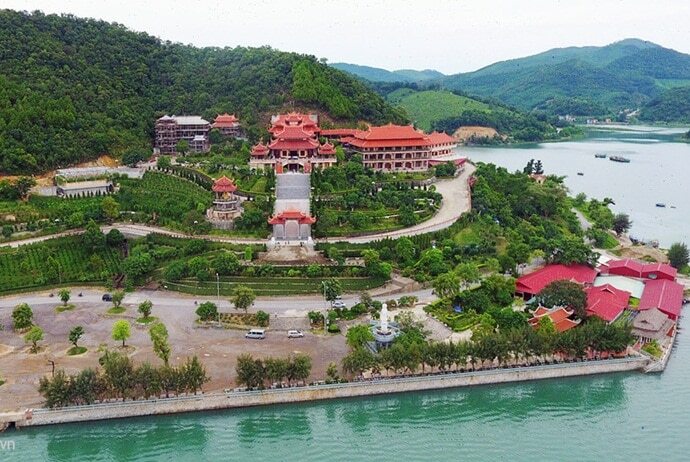 Now, in this article, Vina.com reveals some of the most important things related to Yen Tu Mountain in Quang Ninh province, Vietnam that tourists should know before deciding to go to this holy land. The best time to get to Yen Tu is in spring because the weather is ideal for climbing up the mountains. Addition to this, Yen Tu Festival is also held during this period. This festival starts from the 10th day of the January (lunar calendar) and lasts for three months. It is often most crowded in the first week. Tens of thousands of visitors get to Yen Tu and start their journey. They take this chance to show their belief and also to forget the sorrows and unhappiness while foreign visitors soak in the atmosphere of the festival. Generally, you should not go there during summer due to the heat. If you want to have more space for yourself or avoid the crowds, visit Yen Tu Mountain from September to November because the weather in Vietnam is not hot and cold during this time. Every day, from My Dinh (Mỹ Đình) bus station, there are buses that go to Ha Long and all kind of these buses pass over Yen Tu. So, you can easily go to Yen Tu by bus. You remember to remind the bus’ driver of stopping at Trinh Yen Tu temple to go continuously to Yen Tu. Fare is about 90, 000VND per person. Apart from buses running daily to Ha Long, you can straightly get to Yen Tu by bus. This bus runs on a daily basis on festival season. Out of festival season, this bus only runs on a Sunday. Fare is about 180 000 VND / roundtrip. If you travel by private car or motorbike, you can start from Hanoi to Bac Ninh (Bắc Ninh) before turning into Highway 18 and going to Cam Pha (Cẩm Phả), Dong Trieu (Đông Triều), Uong Bi (Uông Bí). When you see Trinh Yen Tu temple, turn away to Yen Tu. From Trinh Yen Tu temple, take a motorbike or taxi to Yen Tu. 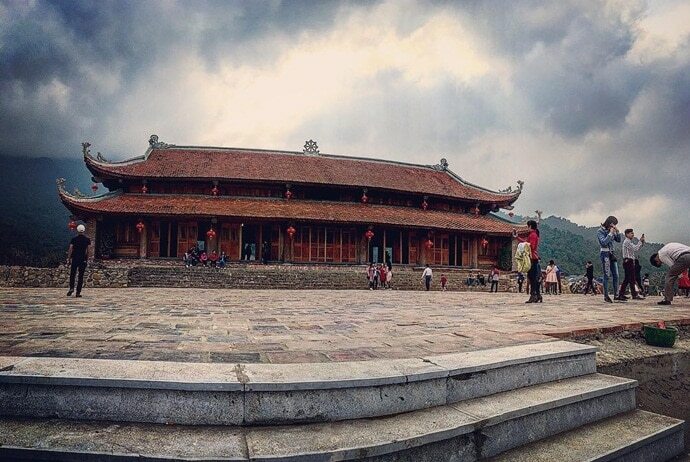 On Yen Tu Mountain, the Buddhist sanctuary was built over 700 years ago. At this time, King Tran Nhan Tong (Trần Nhân Tông) quitted his throne and founded the Truc Lam (Trúc Lâm) Zen sect that is a unique Buddhist culture. Yen Tu Complex has three groups: Yen Tu historical relic and landscape area, the Western Yen Tu relic and landscape area and the area of historical relics of the Tran Dynasty located in Dong Trieu. Every year, from the 10th of January (lunar calendar) and through 3 spring months, many visitors from everywhere come here to attend the Yen Tu Festival in order to worship Buddha, commemorate Buddhist King Tran Nhan Tong as well as enjoy the scenery in spring. 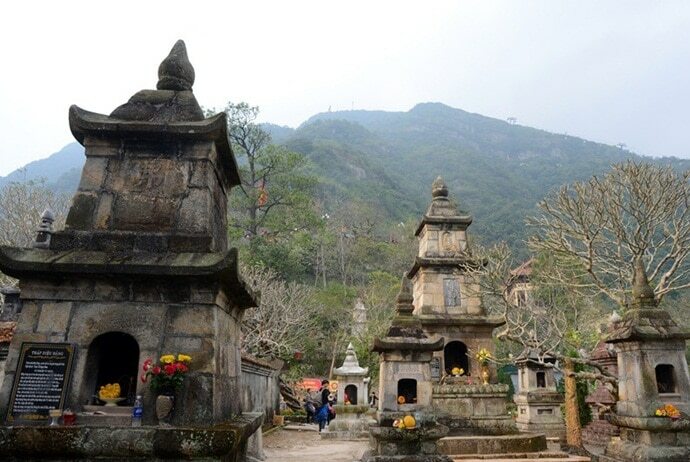 Over time, Yen Tu Mountain in Vietnam still retains Buddhist culture of the Vietnamese people with many pagodas, temples and ancient precious relics that contain ideological and spiritual values of the Truc Lam Zen sect as well as the culture of the Dai Viet in the 13-15 century. 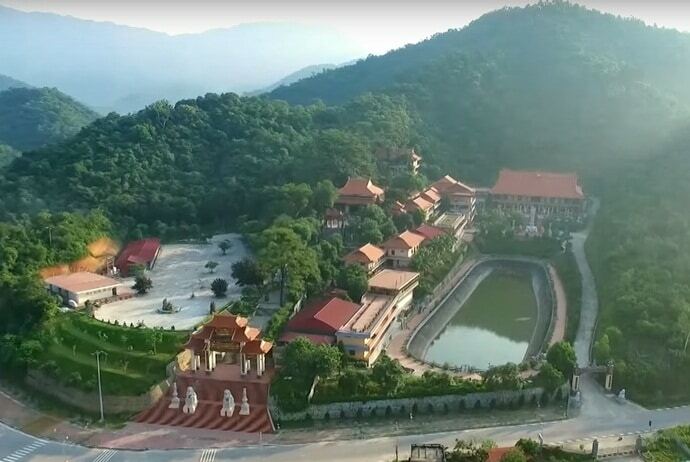 On the way to discover Yen Tu Mountain, the first attraction you may encounter Bathing Brook where King Tran Nhan Tong washed off his earthly life symbolically before becoming a monk. Nearby is Cam Thuc (Cầm Thực) Pagoda where the king had his first vegetarian meal. Climbing for about 30-45 minutes, you may see a green courtyard called Hue Quang (Huệ Quang) Tower Garden with vivid color from different flower species. There is a pagoda here and it is surrounded by 6 enormous towers. Among them, the biggest tower is built to worship King Tran Nhan Tong. The statue is about 62cm high and it features a monk in the meditative pose and it is made of marble. 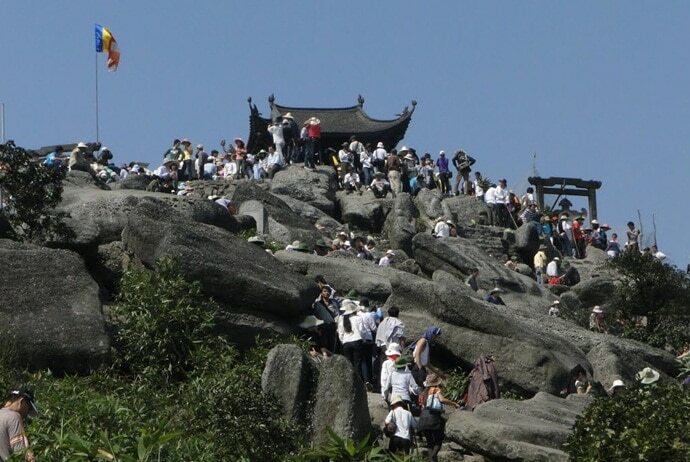 One of the biggest pagodas of Yen Tu Mountain is Hoa Yen (Hoa Yên) Pagoda that is located on the height of about 543m. Here, there is a long row of Glyptostrobus trees that were planted when King Tran Nhan Tong was at Yen Tu. 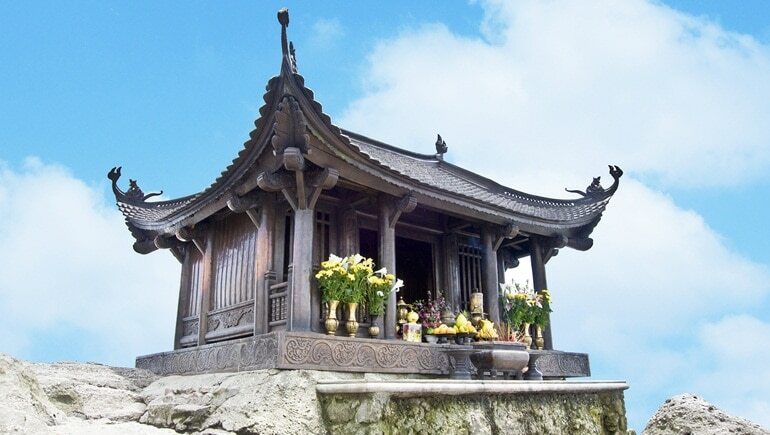 Hoa Yen Pagoda was built during the Ly Dynasty. There are Vang (Vàng) and Bac (Bạc) Waterfalls nearby with pure water all year round. The path continues past Ngoa Van (Ngọa Vân) temple, the Mot Mai pagoda. Walking on, you will be able to come to Heaven’s Gate. Climbing to the height of about 700m is Van Tieu (Vân Tiêu) Pagoda that lies inside layers of white clouds. 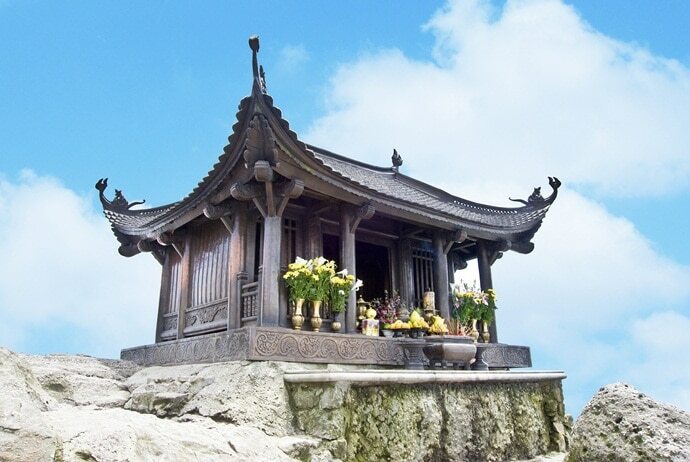 When reaching the height of 1,068m, you can see Dong (Đồng) Pagoda, which is made from copper. Dong Pagoda was built in the 15th century. It is 12m2 wide, 3m high and weighs about 60 tones. It takes about 5-6 hours to get to Dong Pagoda by the rugged trail. Both of these pagodas were built thousand years ago, and are great destinations to visit. When standing on the highest spot of Yen Tu Mountain, you will be able to watch a panorama of the Bach Dang River and Ha Long Bay. Generally, the scene with the sound of the bell, the breeze blowing through the forests, and the smell of incense may make the visitors forget sorrow, selfishness and worry. It is a common feeling for people who get to Yen Tu Mountain in Vietnam. Yen Tu Mountain is 17km away from Quang Ninh (Quảng Ninh) and there are not many hotels for you to stay over. Visitors who want to extend their stay can check the lodging selections at Quang Ninh Center. Yen Tu is famous for its bamboo sprout, so it is the main ingredient in most of the dishes. 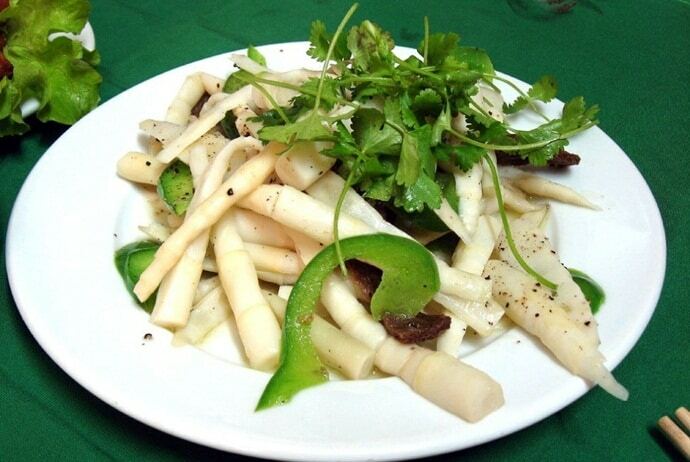 Bamboo sprout can be fried, boiled, or simply eaten with salt and sesame seeds for its freshness. And, there are a few restaurants down the mountain that serve vegetarian food. Preserved in jars or freshly packed in bags, the bamboo shoots can be bought for 10, 000-20,000 VND. Yen Tu Festival is held annually on the 10th day of the January (lunar calendar) and lasts for three months. During Yen Tu festival, many people go to this Buddhist land to show their belief. Other people come here to do sightseeing as well as enjoy the pure atmosphere. At the same time, foreign visitors come here to see famous beauty spots. Many historical and cultural values are preserved here. In Yen Tu, there are 11 main pagodas and hundreds of towers and shrines. On the way to the peak, you can see towers, pagodas, streams and forests. Now, you should keep reading the rest of this article in order to know more about Yen Tu Mountain and then plan to get to Yen Tu as soon as possible. The forests in Yen Tu have 981 species of flora and fauna. Among them, 23 species of animals and 38 species of plants are rare and precious. Looking down from the height of 1,068m above sea level, we can see a beautiful and natural landscape of mountains and forests, which make us feel that we are standing in a fairyland. Previously, Yen Tu Mountain in Quang Ninh was also called Bach Van Son as the top of this mountain was full of white clouds all the year. The walkway from the foot to the top Of Yen Tu Mountain is about 6,000m long. On both sides of the walkway, you can see the forests of green bamboo trees. This tree symbolizes vitality and elegant beauty and it is a symbol of Yen Tu Mountain. Also, this is the reason why King Tran Nhan Tong named his Zen sect Truc Lam. Apart from bamboo trees, this mountain also has a famous road of pine trees. From Lo Ren temple, there are over 200 ancient pine trees. It is said that these trees were planted at the time King Tran Nhan Tong founded Truc Lam Zen sect. These trees are high and have very green leaves. In the past decade, the government invested in the construction of the infrastructure and restoration of the relics in Yen Tu, including the cable car system to serve tourists. 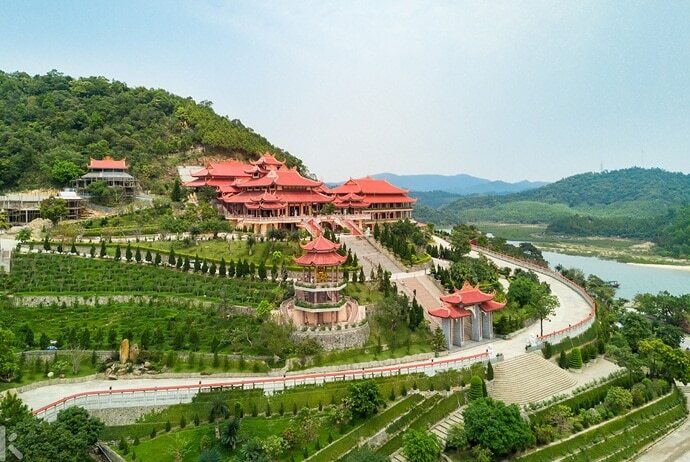 From this system, visitors can enjoy the whole area of Yen Tu Mountain with ancient temples, pagodas as well as towers lying in the bamboo and pine forests. The cable car stops at Hoa Yen Pagoda and helps visitors hike up to the peak. Nonetheless, most visitors will choose to walk because they believe that walking is a great way to express their sincerity to Buddha. Respect local people’s beliefs as Yen Tu is considered as a land of Buddhism in Vietnam. Ensure that you are healthy before deciding to make the hike. Bring along good walking shoes if you want to climb up the mountains. Cable cabs do not work on days with heavy rain or strong wind. So, check the weather forecast before deciding to visit Yen Tu. Do not try any types of traditional herb or medicine offered by local people. Be careful with pickpockets, especially during the festival season. Bring along proper kinds of clothes, depending on the season. If you travel in high season, buy a return ticket of cable car. There, you have explored some of the most important things you should know before going there. Generally, Yen Tu Mountain in Vietnam is a great destination that you should not miss, especially if you are a Buddhist pilgrim and want to worship Buddha and pray for peace and happiness. This holy land will surely not disappoint you and give you unforgettable experience.